Preheat oven to 275°F. Line 24 muffin cups with paper liners. Place a cookie in the bottom of each of 24 liners. In the bowl of a stand mixer fitted with the paddle attachment, mix together cream cheese and sugar. Add peanut butter and sour cream, beat until smooth. Slowly add vanilla and eggs one at a time until incorporated. Divide batter evenly over cookies in prepared muffin cups. Bake 20-23 minutes. Cool 5 minutes. Remove to wire rack to cool completely. Best stored chilled in the refrigerator. Top with Buckeye Bark and chocolate frosting just before serving. Line the bottom of a 9x13 inch pan with parchment paper or silicone baking sheet. Set aside. Melt half of the chocolate according to package directions and pour into lined pan. Spread the chocolate into an even thin layer and set aside to firm up (can be placed in the refrigerator or freezer, if desired). In the bowl of a stand mixer fitted with the paddle attachment, beat together the peanut butter, powdered sugar, butter and vanilla until smooth. Set aside 1/4 - 1/2 cup of the peanut butter mixture. Press the rest into an even layer onto the chocolate layer. Use hands as necessary to flatten. Use remaining 1/4 - 1/2 cup peanut butter mixture to roll into small buckeye balls about the size of a dime. 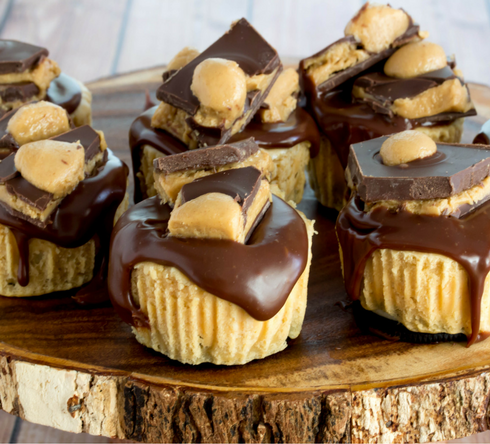 Melt the remaining chocolate and pour it over the peanut butter layer. Drop the mini buckeye peanut butter balls all over the pan. Set aside to become firm. Once chocolate is set, use a large knife to break up the bark into pieces. Store in the refrigerator. You can warm up a store-bought frosting and pour it over the cheesecakes. Or, if you prefer homemade, make a simple chocolate ganache by using the ratio 2 cups chocolate (chocolate candy discs recommended, or chocolate chips or a chopped bar) to 3/4 cup whipping cream. Mix cream and chocolate in a microwave safe bowl. Heat for approximately 1 minute. Whisk until smooth.